The award winning Barefoot Firefly portable solar lamp has undergone technical improvements to improve the durability and longevity of the product. Barefoot Power is proud to offer it's comprehensive 24-month warranty to this lamp. Barefoot Firefly still includes three brightness settings to allow the user to conserve power until it's needed. 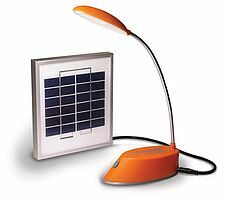 The bright lamp can be used to illuminate a home or shop and can be carried as a portable light source.